The enlargement of the 4th dock has the aim to increase the number of possible anchorage points, in order to reduce the number of ships waiting to dock in the harbor area and to increase the total surface area used in the goods’ deposit on the quay. The enlargement is aimed at determine the correct development of the works in regards to safety, efficiency and improvement of services and is based on different innovations developed in the pasts years regarding both shipping evolution, cargo transfer and handling procedures. Generally, loding/unloading activities carried out at the terminal may vary between 10 and 24 hours per day and for 5/7 days a week. 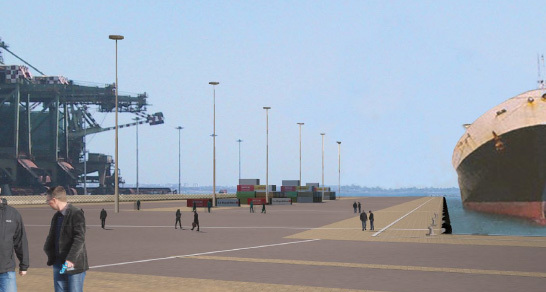 The enlargement of the 4th dock has the aim to create a new quay on the west side of the port, long 600 m, and to increase the current dock’s width from 80 to 200 m. The plan involves the creation of the anchorage quay for the 4th dock by using reinforced concrete cellular caissons positioned at -12,7 m on sea level. The containment work will be carried out using caissons, which generally are considered to be the most expensive solution, but which definitely guarantee the best stability and flexibility in regards to the final embankment result. The caissons will be grounded on a tout-venant bench on the foundation ditch. The caissons will be then finished with a superstructure in cls where all furnishing, such as fenders, bollards and service tunnels will be placed. The transit area behind the quay will be then finished with appropriate pavement. The entire area in front of the dock will be dredged so to reach a final depth of 12,0 m and will be carried out following three main steps. • 1st step – creation of the canal for the transport of the caissons: in the area external to the 4th dock and starting at a depth of 10 m. It will be necessary to dig an access canal to the dock which will be 400m long and 35 m wide, at the -10m on sea level, so to allow the correct transport of the caissons to their placing position. • 2nd step – creation of the foundation for the caissons: in this phase, an area of 23 m wide and at -14m on sea level will be dredge, so to realize a rubble layer foundation in quarry material and 1,30 m thick. 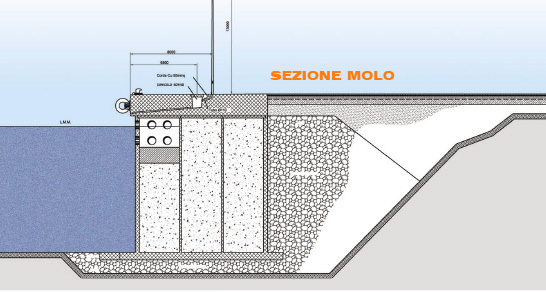 • 3rd step – dredging of the ocean floor in front of the dock: after having finished the placement of the caissons and the positioning of stone material having adequate dimensions (5-50 kg), the entire area in front of the caissons will be dredged for about 190 m and at -2,0 m sea level. 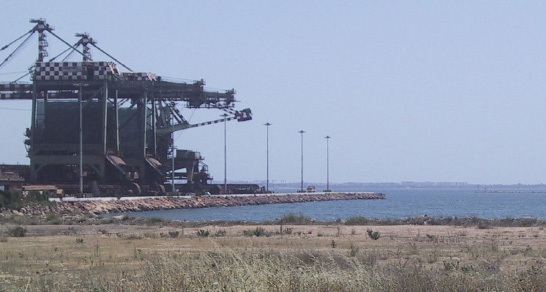 There will also be a connection area between the dock’s level at -12,0 m and the basin’s level at 7,0 m.
The ocean bottom’s dredging from the current depth to -12 m will mainly concern clay soils, with the only exception of the topsoil layer, which is made by silt sands characterized by high concentrations of organic materials. The total dredging material volume will be of 1,481,201 m3. The techniques used in the dredging process will vary in accordance to the ocean floor characteristics: suction dredges equipped with a sediment destroyer or with a grabber will be used in case of clay soils. The remediation activities will be carried out using adequate devices in order to limit possible environmental contamination. 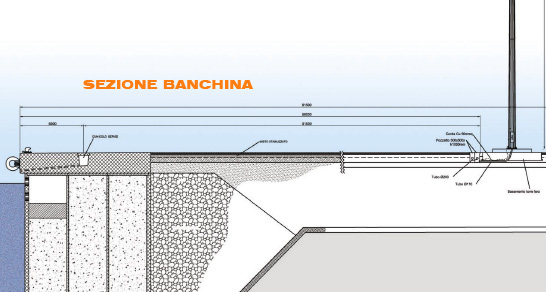 Embankments will be created using dry mine materials complying with the necessary quality requisites; the replenishment will be used in future phases and the area of the 4th dock will be separated in 4 separate areas of about 100m x 150m, paying attention to compensate possible subsidence movements which may occur. The replenishment must be created using an on-land excavator which will proceed on a specific compacted path created above sea level. The final hight of the service areas and quays will be of +3,00 m above sea level. The quay area of the 4th dock will be created using a series of prefabricated cellular caissons and by a jetty superstructure. The caissons will be placed at -12,70 m under sea level on a rubble layer foundation in quarry material and -14,0 m and 1,3 m thick. The height of the superstructures is of +1,0 m above sea level, while the thickness of the jetty made in the second phase during the superstructure creation (or containment beam) will be of 2 m. The quay’s height will therefore be of +3,0 m above sea level. The length of the prefabricated caissons is of 29,48 m, their width is of 12,84 m while the base is of 15,84 m (1,5 m of base on both the basin’s and embankment side). The internal volume of the caisson is subdivided in 8 x 3 cells. Anti-reflecting cells will be used for the side facing the sea and will be created thought circular holes which will mitigate the wave motion and minimize the turbulence inside the harbor. The cells will be filled with adequate material so to guarantee the overall stability of the caissons. Furthermore, three extra caissons of smaller dimensions will also be used to close the extremity of the dock itself. Behind the caissons, an appropriate stone support will be placed in order to guarantee the correct transit of the construction site’s vehicles; the remaining area will be filled with dry mine material having appropriate characteristics. The pavement is of a flexible kind and will be made of cls blocks (erecting blocks), a sand layer, a bituminous conglomerate layer, a stabilized mix and a final geogrid. Along the entire quay of the 4th dock, a total of 29 cast iron round bollards of 100 t, 56 rubber fenders 1400 x 700 mm (L=2,0 m) and an angle rubber fender 1400 x 700 mm (L=1,0 m) will be displayed. The lightening system of the 4th dock will have spotlights, made in painted aluminum and fixed on headlight towers at a height of 35 m. The quay area of the 4th dock will be lighten up by spotlights made in painted aluminum and fixed on towers of 13 m of height. In regards to the water discharge system, the area has been divided into six separate sectors which are connected to six tanks collecting the first flush rainwater, each one of them connected to an oil separator and main drainage collector which runs perpendicularly to the sea line. In order to protect the area involved in the enlargement of the 4th dock works, an underground fire hydrant system will be created.The pipeline of the system has been designed with a ring shape in order to allow the system itself to guarantee the service even in case of unexpected interruptions in the pipeline. The entire plant will be supplied by a pumping station formed by a main electric pump, a diesel emergency motor pump, having the same characteristics of the main electric pump, and by a pilot electric pump which will be used to conserve the plant’s internal pressure. The pumping fire group will be overhead. The plant will use sea water, which will be directed towards the plant throughout a specific adequate sea connection.